For a recent photo assignment, Jim Cornfield chose to create an environmental portrait of Air Force Capt. Kenneth Curry, telling a story in images by connecting the pilot to his former military experience. The environmental portrait is one of photography’s simpler ideas: An image of a subject that includes his or her external life—some place or object, or both—revealing more than merely what a person looks like. I’ve personally found this imaging style to be a rewarding cerebral exercise, and I relish such assignments. Here’s a detailed look at one of my own recent environmental portrait scenarios, from its origin and backstory to lighting and post-production. I hope it will be informative, maybe even inspirational. Retired aviation executive Kenneth Curry is a decorated Vietnam veteran, one of many wartime returnees with combat-related post-traumatic stress disorder (PTSD). I photographed him as a spokesperson for a California-based PTSD outreach campaign. For me, the only approach to this assignment was an environmental portrait, to symbolically connect this 70-year-old with the most honored and most disturbing of his military experiences. 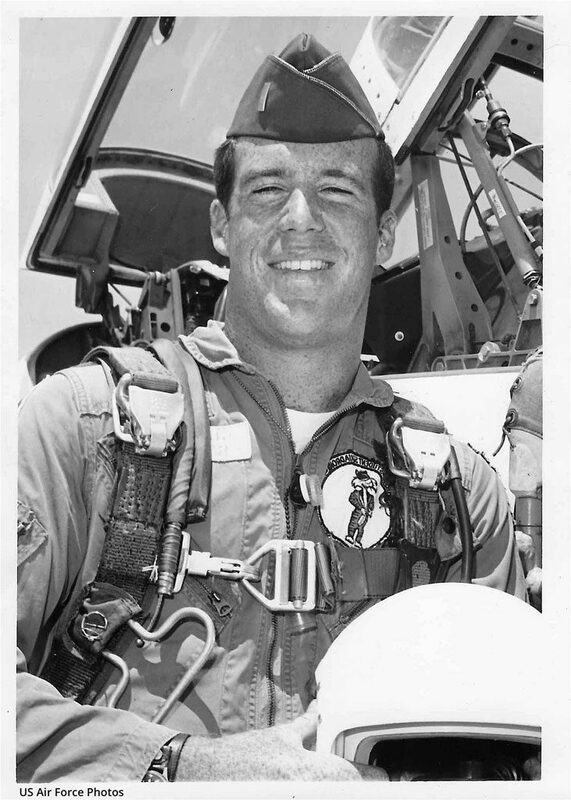 On April 9, 1972, Air Force Capt. Curry was the pilot-in-command of the very airplane that appears in the portrait above, a B-52D Stratofortress. That day, over North Vietnam, the airplane, designated by the call sign “Aqua 2,” became the first B-52 in that war to be struck by enemy surface-to-air missile fire (SAM). The SAM blasted over 40 holes in the wings and fuselage, making the plane almost unflyable. Rather than order his five-man crew to eject, Curry kept the plane aloft and returned to the nearest friendly landing site at Danang, a field intended for smaller fighter aircraft and far too short to land a lumbering B-52. Curry quickly weighed the risks and coaxed the plane down to a successful emergency landing, saving the lives of everyone onboard. Soon after, Curry received the Distinguished Flying Cross for this achievement. There was an honor in store for the airplane, as well. After being retired from service, Aqua 2 was scheduled to be cut up for salvage at a B-52 “boneyard” in Arizona. A California aviation buff who knew of the bomber’s history avoided that fate, and the big plane was soon relocated to the National Museum of the U.S. Air Force at Wright-Patterson Air Force Base in Dayton, Ohio. That’s where it resides today, the centerpiece of the museum’s Southeast Asia aircraft gallery. When Curry met me for this photograph, he couldn’t look up at the airplane without a little emotion. I wanted to show this inharmonious bond between Capt. Curry and this formidable machine. He’s both a hero and a victim of the Aqua 2 mission. On that day, he was aircraft commander during the most critical hours of that airplane’s life and probably the lives of his crew, as well. Yet in the aftermath, he lives with personal demons that plague him to this day. To me, the best pictorial approach was to fuse his heroic role in the drama with the overarching importance of that airplane—still showing its own battle scars despite its restoration a few years ago. The airplane, Aqua 2, seemed like the ideal backdrop for this portrait, given its notoriety. (The press had covered the SAM missile strike from the moment Curry and his crew touched down in Danang.) I made contact early on with the museum to request a photo session on its property. The process of environmental portraiture always starts with selecting the location, and some are easier to manage than others. Access to private offices, homes and most workplaces are usually the province of your subject. Access to public areas, particularly government-run venues, usually requires some extra effort. There are permits, sometimes fees, and a certain amount of bureaucracy to dance around. The museum granted me use of the space for this project, but limited it to an early-morning two-hour time window before doors opened to the public. Prep is most of the battle with environmental portraits. In this museum setting, lighting was a major consideration, given the relatively dark exhibit space and the imposing size of the background prop, a B-52 bomber. Prep is most of the battle with an environmental portrait. It’s always important to previsualize an image and to “front load” as much of your workflow as possible. Most subjects will have limited time and attention spans. You’ll often be restricted by changes in available lighting, foot traffic through your location and any number of exigencies that can ambush a shot. You have to prepare. In this particular situation, lighting was a major consideration, given the relatively dark exhibit space and the imposing size of my chosen background prop. I arrived a day early for a “tech scout” to look for possible unobstructed camera positions, the location of power outlets and any potential lighting problems. Owing to the enormous scale of this area, I knew I would have to use the museum’s house lighting to supplement the electronic flash units that would light my subject. The color temperature of the museum’s ceiling lamps is 3200˚ K, so I would filter my strobes (5000˚ K) to match the overheads. With both sources adjusted to 3200˚, I could simply set my camera’s color temperature accordingly to achieve consistent foreground and background color. Putting enough light on the plane’s fuselage was another problem. 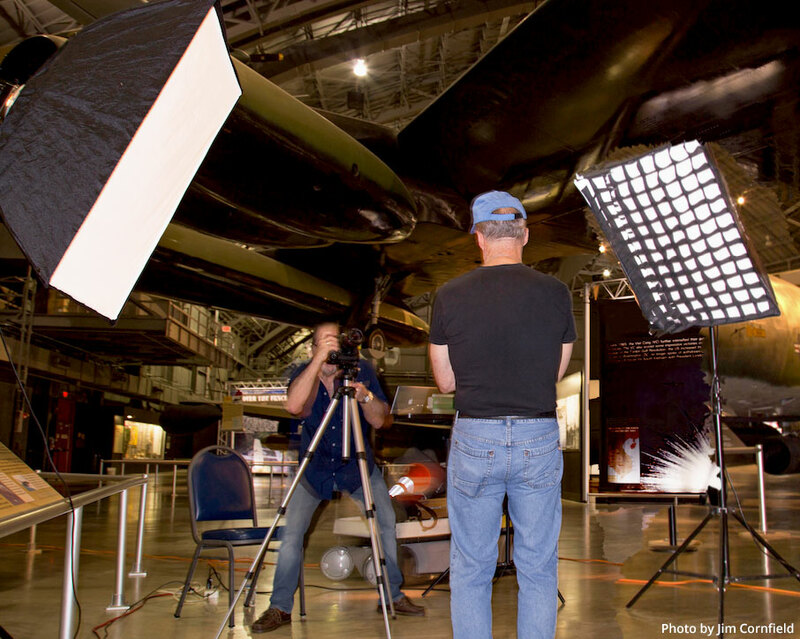 My location lighting kit was limited to three AlienBees monolight units, easily transportable in a single case, but lacking the power to illuminate the B-52’s dark warpaint. A filmmaker on the base loaned me a half-dozen 2K tungsten-halogen lamps, which solved that problem. One crucial prep area involved the subject himself. He was a bit conflicted about revisiting this critical moment in his life, so I spent some time with him inspecting the airplane, hearing anecdotes from his Vietnam service, and looking through some photos of him and his crew during that period. This kind of link to your subject is crucial to serious portraiture. It’s the key to making your final result truthful and communicative. I knew I wanted to depict Capt. Curry as the man in charge, standing in front of his airplane, but any of those rakish “flyboy” grins or the classic heroic pilot pose staring off into the wild blue yonder wouldn’t tell the story of this officer’s relationship to the giant warbird behind him. Shooting in a formal exhibit of any kind always presents the challenge of using framing and stagecraft to make the space look like anything but a manufactured exhibit. For this image, that was partly a matter of positioning the camera low, with its zoom lens set to around 32mm, to include just the surrounding elements that helped support the story—principally, the airplane and the rigid industrial “gestalt” of the hangar ceiling. The lamps were two of the AlienBees, one fitted with a large softbox as a main light and a second, medium softbox with a honeycomb grid to create a controlled accent light along the opposite side of the subject’s face. Each of these boxes was equipped with Rosco CTO conversion gels to do the color balancing. 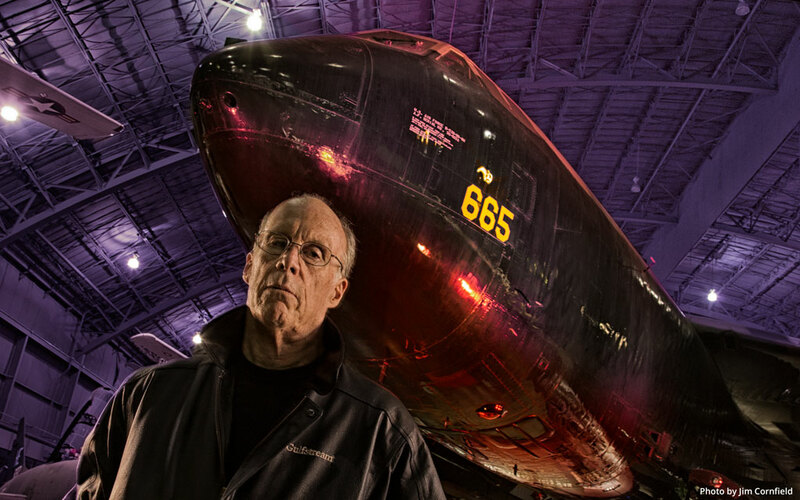 With this “split-lighting” configuration for my subject, I added five 2K tungsten lamps to put highlights on and below the airplane’s fuselage. These were used directly with no modulation in order to emphasize the sheen and the signs of wear on the skin of this veteran combat aircraft. 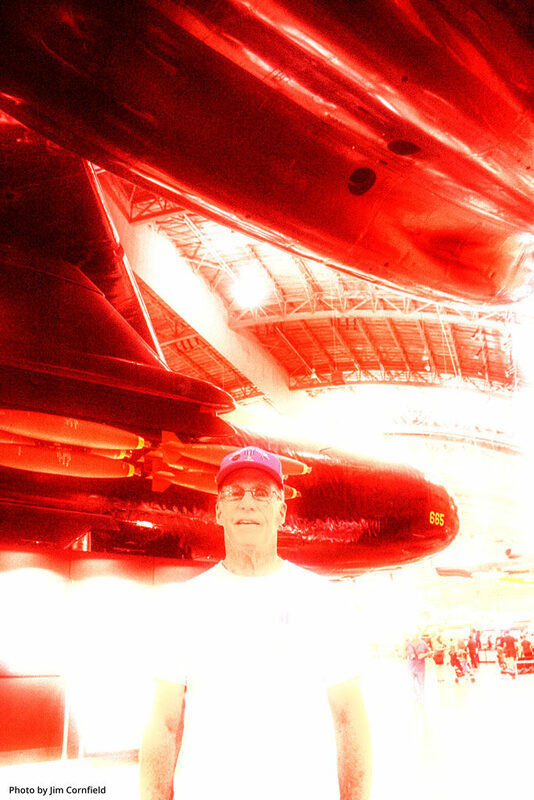 I covered each lamp with a red gel to suggest the fires of battle—a symbolic departure from reality to make the point that this airplane is a lethal, blast-generating weapon system. This shoot scenario contains a good message about wardrobe. Details of garment selection can make telling statements about your subject in an environmental portrait. I did two versions of the initial setup, some with Capt. Curry in a black T-shirt and baseball cap, others with the leather jacket showing a Gulfstream Aircraft logo. The leather quickly establishes him as a possible pilot—leather “bomber” jackets have that traditional association. In the T-shirt and cap, he’s less recognizable as an aviator and takes on a more vulnerable role as an ordinary civilian, even a tourist revisiting a distant part of his past. The climax of creating an environmental portrait is, of course, after capture, mostly cropping or color correction to support the role of the background or props. I personally don’t often use special effects to embellish a portrait. But with some environmental portraits, they can help to reinforce the resonance between subject and surroundings, particularly when that relationship has a symbolic role in that person’s story. Such is the case with the opening image, where I used an interesting filter, Dark Contrasts, in the Photoshop plug-in suite Google Nik Color Efex Pro 4, to create a slight textural richness by enhancing the structure of highlight and shadow details. This imparts to the image a nuanced period feel, invoking the 40 or so years since our Vietnam involvement ended. In any serious portrait, you always hope that some nugget of truth will be revealed. But the human face is one of nature’s best instruments for conveying ambiguous messages. So a more expressive alternative has often been the resilient environmental portrait—an imaging style that’s as much about storytelling as it is about photography. Beyond my initial take on the drama of Aqua 2, there were two other interpretations that I thought might get closer to the idea of Capt. Curry’s PTSD, things that must affect other pilots who have had similar experiences. One was the image of Capt. Curry beneath the B-52’s wing, surrounded by symbolic icons of air warfare—the menacing teardrop shapes of fuselage and drop tanks and the racks of deadly bombs. My other notion of the darker side of this subject invoked a thought that plagues many high-altitude bomber pilots. Their trusted aircraft might get them to and from their jobs, but it’s also an instrument of extreme violence. There must inevitably be some guilt that lurks over the destructive power, the white, searing light the crews and their planes rain down on other human beings, enemy or not.